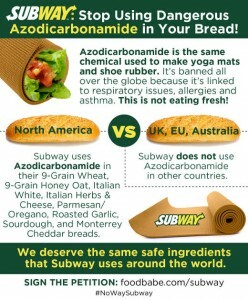 Subway, one of the world’s biggest bread bakers, is removing a yoga mat chemical from its breads that raised the ire of an influential health activist and food blogger. Subway has used the ingredient as a “bread conditioner” which adds elasticity and whitens the dough. The chemical, though, is especially damning in the food industry because of its other broad uses in plastics, rubber and synthetic leather production. According to Subway’s statement, the company says it had already had the removal process underway and its actions were not a result of Hari’s outcry. “We are already in the process of removing Azodiacarbonamide as part of our bread improvement efforts despite the fact that it is USDA and FDA approved ingredient. The complete conversion to have this product out of the bread will be done soon.” The chemical is also approved by the FDA as a bleaching or aging ingredient in cereal flour, although the World Health Organization has linked the chemical to respiratory issues, including allergies and asthma. Still, Hari has lauded Subway’s decision, but she asks fans to refrain from eating Subway until the chain gets the problem fixed. Wow, I just knew this. Thanks for posting! I never knew this was an ingredient in subway bread. Thing is I don’t really think it’s as big as a problem as some are saying. I am happy to see them take it out if it does cause some problems in people, but I’ve eaten subway a lot in my life and never had a problem because of their food. I am all for making food healthier and safer though, so if it does make their food safer, then go for it.